2 Nights Accommodation (Friday and Saturday), 2 breakfasts, 2 lunches, 1 dinner & snacks. Children under 16 years of age attending conference with a member or non-member parent. NOTE: THERE IS NO CHILD CARE AVAILABLE ON SITE, PARENTS ARE RESPONSIBLE FOR THEIR OWN CHILDREN AND MAY BE ASKED TO LEAVE THE IMMEDIATE CONFERENCE AREA IF CHILDREN ARE BEING TOO DISRUPTIVE. To register, click on the REGISTER button, located below the fees listing on the left side of this page. We invite you to join us for two days of Natural Building Professional Development on March 1 and 2, 2014, at our annual Natural Building Conference. Like previous years, there will be a variety of workshops, round table discussions, and presentations on a variety of topics of interest to builders and potential owner-builders. For Ride Shares, go to our Facebook Ride Share Page. 1:30 pm Setting Goals and Priorities for Sustainable Projects with Chris Magwood from Peterborough, ON, Canada. By moving away from the idea that there is only one right or wrong way to build, but rather many options that can be combined to meet the goals of a particular project, for a particular owner on a particular site, Chris will discuss the multiple pathways to a successful sustainable building. Chris’ presentation quantifies the impacts of a wide range of green, natural, and alternative materials and systems according to key criteria. 3:00 pm Reporting from the Front Lines -with a few Back Stories with David Eisenberg from Arizona, USA. 5:00 pm BaleHeart Bar opens with organic wines and craft beers and ales. 8:30 pm Social Networking Party Saturday Night, featuring music by Rick Fines, guitar player, song-writer and recording artist. Winner of two Canadian Maple Blues awards. 9:00 am Emerge Leadership with David Eisenberg from Arizona, USA. 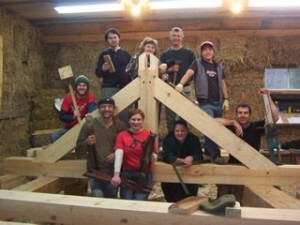 1:30 pm The ASRi Straw Bale Alternative Solutions Resource with Dawn Marie Smith from Vancouver, BC, Canada. To register, click on the REGISTER button, located below the fees listing, on the left side of this page. Non-members can obtain member pricing, by becoming a new member (starts at $20) before registering. There will be opportunity for free display tables (2’ – 4’ space only) for our Professional Members as well as presentation boards of current work to display.